Former heptathlete Kelly Sotherton today became the first athlete to be commemorated in Birmingham’s ‘Parade of Champions’. The idea behind the ‘Parade of Champions’ is to celebrate the world’s greatest athletes who have competed in Britain’s second city. The Parade begins by honouring 2004 Olympic bronze medallist Sotherton and will be completed to mark Birmingham hosting the IAAF World Indoor Championships in 2018. Over the next 20 months the public will be asked to select ‘Champions’ whose footprint and career achievements will be set in specially-designed pavement plaques at the Alexander Stadium. “It’s extraordinary that practically every great legend of athletics has competed in this city,” said Sotherton, who as well as her Olympic heptathlon bronze also claimed world bronze in 2007 and the Commonwealth title in 2006. “I am honoured to be asked to launch the ‘Parade of Champions’ today. I am really looking forward to seeing my name set in stone here at the Alexander Stadium where so many wonderful memories have been made. The idea to celebrate Birmingham’s global athletics history came from UK Athletics’ chief executive officer Niels de Vos. “Birmingham is a key city for global athletics and continually plays host to the best athletes from around the world,” he said. 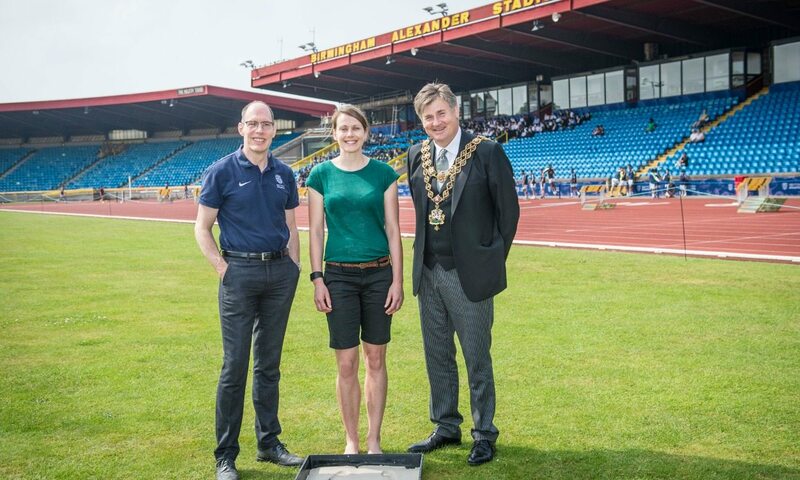 “We are looking forward to the next two years of athletics in the city building up to 2018 but our current focus is the amazing performances we are anticipating from June 24-26 when British athletes fight for their place on the GB Olympic team for Rio. The public will have the chance to make suggestions as to who they would like to see commemorated in the ‘Parade of Champions’ at Alexander Stadium via British Athletics’ social media channels.